On yesterday’s blog post I talked about afterschool activities and went into the importance of remaining active after school hours come to an end. Just because school is over for the day doesn’t mean it’s time to shut down your brain! Keep that muscle moving! It’s healthy to keep it active! One great way to keep your brain working like a well-oiled machine is to keep yourself properly hydrated. When you’re in the classroom or other school area for your afterschool activity, it can easily become a chore to have to walk down long, school corridors and up the stairs for a simple sip of water from the fountain. But you really shouldn’t deny yourself water when your body is telling you that you want some. Drink when you please with a handy water bottle at your side for your afterschool hours. I’m sure everyone’s aware of water’s importance in our lives and extremely important to our own survival. It makes up 60% of our own bodies. Fortunately our bodies are great at letting us know when we need to refuel in order to stay hydrated; so you definitely want to listen when your body says it needs so me. Everything Summer Camp offers a great collection of varying types of water bottles. 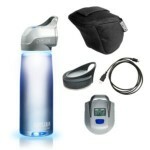 Check out the CamelBak All Clear UV Water Bottle that purifies your water before you drink it! CamelBak All Clear turns nearly any tap or clear natural water source into potable drinking water in just 60 seconds. Or maybe a Vapur Water Bottle is more your style. Almost 90% lighter than any rigid water bottle, Vapur Bottles are actually the antithesis of a water bottle! The Vapur Anti-Bottle stands up just like any traditional water bottle when it’s holding water. Once empty, though, the Vapur Anit-Bottle flattens, folds, and fits just about anywhere. Check out all the rest of our water bottle at Everything Summer Camp and keep one with you for your school day and afterschool hours. Till next time!